This article is about the biblical book. For other uses, see Judge (disambiguation). The Book of Judges (ספר שופטים, Sefer Shoftim) is the seventh book of the Hebrew Bible and the Christian Old Testament. In the narrative of the Hebrew Bible, it covers the time between the conquest described in the Book of Joshua and the establishment of a kingdom in the Books of Samuel, during which Biblical judges served as temporary leaders. The stories follow a consistent pattern: the people are unfaithful to Yahweh and he therefore delivers them into the hands of their enemies; the people repent and entreat Yahweh for mercy, which he sends in the form of a leader or champion (a "judge"; see shophet); the judge delivers the Israelites from oppression and they prosper, but soon they fall again into unfaithfulness and the cycle is repeated. Scholars consider many of the stories in Judges to be the oldest in the Deuteronomistic history, with their major redaction dated to the 8th century BCE and with materials such as the Song of Deborah dating from much earlier. Judges can be divided into three major sections: a double prologue (chapters 1:1–3:6), a main body (3:7–16:31), and a double epilogue (17–21). The book opens with the Israelites in the land that God has promised to them, but worshiping "foreign gods" instead of Yahweh, the God of Israel, and with the Canaanites still present everywhere. Chapters 1:1–2:5 are thus a confession of failure, while chapters 2:6–3:6 are a major summary and reflection from the Deuteronomists. Once peace is regained, Israel does right and receives Yahweh's blessings for a time, but relapses later into doing evil and repeats the pattern set forth above. Judges follows the Book of Joshua and opens with a reference to Joshua's death (Joshua 24:29; cf. Judges 1:1). The Cambridge Bible for Schools and Colleges suggests that "the death of Joshua may be regarded as marking the division between the period of conquest and the period of occupation", the latter being the focus of the Book of Judges. The Israelites meet, most likely at the sanctuary at Gilgal or at Shechem (following on from Joshua 24:1–33) and ask the Lord who should be first (in order of time, not of rank) to secure the land they are to occupy. Map of the tribes of Israel. There are also brief glosses on six minor judges: Shamgar (3:31), Tola and Jair (10:1–5), Ibzan, Elon, and Abdon (12:8–15). Some scholars have inferred that the minor judges were actual adjudicators, whereas the major judges were leaders and did not actually make legal judgements. The only major judge described as making legal judgments is Deborah (4:4). Battle of Gibeah (19–21), a war between Benjamin and the other tribes. Despite their appearance at the end of the book, certain characters (like Jonathan, the grandson of Moses) and idioms present in the epilogue show that the events therein depict a point in time early in the period of the judges. Judges contains a chronology of its events. It is overtly schematic and, according to biblical scholar Jeremy Hughes, shows signs of having been introduced at a later period. It is unclear if any of the people named as judges existed. The basic source for Judges was a collection of loosely connected stories about tribal heroes who saved the people in battle. This original "book of saviours" made up of the stories of Ehud, Jael and parts of Gideon, had already been enlarged and transformed into "wars of Yahweh" before being given a comprehensive Deuteronomistic revision. In the 20th century, the first part of the prologue (chapters 1:1–2:5) and the two parts of the epilogue (17–21) were commonly seen as miscellaneous collections of fragments tacked onto the main text, and the second part of the prologue (2:6–3:6) as an introduction composed expressly for the book. More recently, this view has been challenged, and there is an increasing willingness to see Judges as the work of a single individual, working by carefully selecting, reworking and positioning his source material to introduce and conclude his themes. A statement repeated throughout the epilogue, "In those days there was no king in Israel" (Judges 17:6, 18:1, 19:1, and 21:25) implies a date in the monarchic period for the redaction (editing) of Judges. 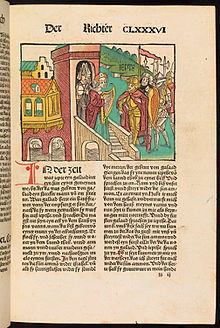 Twice, this statement is accompanied with the added statement, "every man did that which was right in his own eyes", implying that the redactor is pro-monarchy, (Judges 17:6 and 21:25) and the epilogue, in which the tribe of Judah is assigned a leadership role, implies that this redaction took place in Judah. Since the second half of the 20th century most scholars have agreed with Martin Noth's thesis that the books of Deuteronomy, Joshua, Judges, Samuel and Kings form parts of a single work. Noth maintained that the history was written in the early Exilic period (6th century BCE) in order to demonstrate how Israel's history was worked out in accordance with the theology expressed in the book of Deuteronomy (which thus provides the name "Deuteronomistic"). Noth believed that this history was the work of a single author, living in the mid-6th century BCE, selecting, editing and composing from his sources to produce a coherent work. Frank Moore Cross later proposed that an early version of the history was composed in Jerusalem in Josiah's time (late 7th century BCE); this first version, Dtr1, was then revised and expanded to create a second edition, that identified by Noth, and which Cross labelled Dtr2. Scholars agree that the Deuteronomists' hand can be seen in Judges through the book's cyclical nature: the Israelites fall into idolatry, God punishes them for their sins with oppression by foreign peoples, the Israelites cry out to God for help, and God sends a judge to deliver them from the foreign oppression. After a period of peace, the cycle recurs. Scholars also suggest that the Deuteronomists also included the humorous and sometimes disparaging commentary found in the book such as the story of the tribe of Ephraim who could not pronounce the word "shibboleth" correctly (12:5–6). The essence of Deuteronomistic theology is that Israel has entered into a covenant (a treaty, a binding agreement) with the God Yahweh, under which they agree to accept Yahweh as their god (hence the phrase "God of Israel") and Yahweh promises them a land where they can live in peace and prosperity. 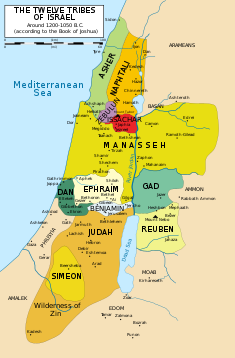 Deuteronomy contains the laws by which Israel is to live in the promised land, Joshua chronicles the conquest of Canaan, the promised land, and its allotment among the tribes, Judges describes the settlement of the land, Samuel the consolidation of the land and people under David, and Kings the destruction of kingship and loss of the land. The final tragedy described in Kings is the result of Israel's failure to uphold its part of the covenant: faithfulness to Yahweh brings success, economic, military and political, but unfaithfulness brings defeat and oppression. This is the theme played out in Judges: the people are unfaithful to Yahweh and he therefore delivers them into the hands of their enemies; the people then repent and entreat Yahweh for mercy, which he sends in the form of a judge; the judge delivers the Israelites from oppression, but after a while they fall into unfaithfulness again and the cycle is repeated. Further themes are also present: the "sovereign freedom of Yahweh" (God does not always do what is expected of him); the "satirisation of foreign kings" (who consistently underestimate Israel and Yahweh); the concept of the "flawed agent" (judges who are not adequate to the task before them) and the disunity of the Israelite community (which gathers pace as the stories succeed one another). The book is as intriguing for the themes it leaves out as for what it includes: the Ark of the Covenant, which is given so much importance in the stories of Moses and Joshua, is almost entirely missing, cooperation between the various tribes is limited, and there is no mention of a central shrine for worship and only limited reference to a High Priest of Israel (the office to which Aaron was appointed at the end of the Exodus story). Although Judges probably had a monarchist redaction (see above), the book contains passages and themes that represent anti-monarchist views. One of the major themes of the book is Yahweh's sovereignty and the importance of being loyal to Him and His laws above all other gods and sovereigns. Indeed, the authority of the judges comes not through prominent dynasties nor through elections or appointments, but rather through the spirit of God. Anti-monarchist theology is most apparent toward the end of the Gideon cycle in which the Israelites beg Gideon to create a dynastic monarchy over them and Gideon refuses. The rest of Gideon's lifetime saw peace in the land, but after Gideon's death, his son Abimelech ruled Shechem as a Machiavellian tyrant guilty for much bloodshed (see chapters 8 and 9). However, the last few chapters of Judges (specifically, the stories of Samson, Micah, and Gibeah) highlight the violence and anarchy of decentralized rule. Most of the great women in the Bible either are married to a great man or related to one. ... A rare exception to this tradition is the prophetess and judge Deborah, perhaps the Bible's greatest woman figure. Deborah stands exclusively on her own merits. The only thing we know about her personal life is the name of her husband, Lapidot. ^ a b Soggin, p. 4. ^ a b Guest, p. 190. ^ Guest 2003, p. 190. ^ a b Bacon, p. 561. ^ Thomas L. Thompson (1 January 2000). Early History of the Israelite People: From the Written & Archaeological Sources. BRILL. p. 96. ISBN 978-90-04-11943-7. ^ Marc Zvi Brettler (2002). The Book of Judges. Psychology Press. p. 107. ISBN 978-0-415-16216-6. ^ Philip R. Davies (1995). In Search of "Ancient Israel": A Study in Biblical Origins. A&C Black. p. 26. ISBN 978-1-85075-737-5. ^ Knoppers 2000a, p. 1. ^ Knoppers 2000b, p. 119. Amit, Yairah. "Judges" Introduction and Annotations. The Jewish Study Bible. Ed. Adele Berlin and Marc Zvi Brettler. New York: Oxford University Press, 2004. 508–57. Bacon, Gershon and S. David Sperling. "Judges (Heb.שופטים), Book of." Encyclopaedia Judaica. Second Edition, Volume 11. pp. 561–66. Davis, John J. and Herbert Wolf. Judges Introduction and Annotations. Zondervan NIV Study Bible (Fully Revised). Ed. Kenneth L. Barker. Grand Rapids, MI: Zondervan, 2002. 326–63. Eynikel, Erik (1996). The reform of King Josiah and the composition of the Deuteronomistic history. Brill. ISBN 978-90-04-10266-8. Guest, P. Deryn (2003). "Judges". In James D. G. Dunn; John William Rogerson (eds.). Eerdmans Commentary on the Bible. Eerdmans. ISBN 978-0-8028-3711-0. Hughes, Jeremy (1990). Secrets of the Times: Myth and History in Biblical Chronology. A&C Black. ISBN 9780567629302. Knight, Douglas A (1995). "Deuteronomy and the Deuteronomists". In James Luther Mays; David L. Petersen; Kent Harold Richards (eds.). Old Testament Interpretation. T&T Clark. ISBN 978-0-567-29289-6. Knoppers, Gary (2000a). "Introduction". In Gary N. Knoppers; J. Gordon McConville (eds.). Reconsidering Israel and Judah: recent studies on the Deuteronomistic history. Eisenbrauns. ISBN 978-1-57506-037-8. Knoppers, Gary (2000b). "Is There a Future for the Deuteronomistic History?". In Thomas Romer (ed.). The Future of the Deuteronomistic History. Leuven University Press. ISBN 978-90-429-0858-1. Malamat A., "Chapter VII: The Period of the Judges" Judges. The World History of the Jewish People. 3. Givatayim, Israel: Rutgers UP, 1971. pp. 129–63. Matthews, Victor Harold (2004). Judges and Ruth. Cambridge University Press. ISBN 978-0-521-00066-6. Miller, J Maxwell (1995). "The Ancient Near East and Archaeology". In James Luther Mays; David L. Petersen; Kent Harold Richards (eds.). Old Testament Interpretation. T&T Clark. ISBN 978-0-567-29289-6. Niditch, Susan (2008). Judges: a commentary. Westminster John Knox Press. ISBN 978-0-664-22096-9. Perdue, Leo G (2001). "Preface: The Hebrew Bible in Current Research". In Leo G. Perdue (ed.). The Blackwell Companion to the Hebrew Bible. Blackwell. ISBN 978-0-631-21071-9. De Pury, Albert; Romer, Thomas (2000). "Deuteronomistic Historiography: History of Research and Related Issues". In Albert de Pury; Thomas Romer; Jean-Daniel Macchi (eds.). Israël constructs its history: Deuteronomistic historiography in recent research. Sheffield Academic Press. ISBN 978-1-84127-099-9. Soggin, Alberto (1981). Judges. Westminster John Knox Press. ISBN 978-0-664-22321-2. Spieckerman, Hermann (2001). "The Deuteronomistic History". In Leo G. Perdue (ed.). The Blackwell companion to the Hebrew Bible. Blackwell. ISBN 978-0-631-21071-9. Telushkin, Joseph. 'Biblical Literacy: The Most Important People, Events, and Ideas of the Hebrew Bible. New York: William Morrow and Company, 1997. Walton, John H (2009). "The Deuteronomistic History". In Andrew E. Hill; John H. Walton (eds.). A Survey of the Old Testament. Zondervan. ISBN 978-0-310-22903-2. Look up Judges in Wiktionary, the free dictionary.